I was thinking of stitching another ornament, but I don't want to stop stitching this! I would love to get it finished by Christmas, but I don't think that's going to happen. We are going down to Florida this weekend to visit family for Christmas. It's going to be a busy week next week. Oh well, maybe I should stitch that ornament? Write soon! Looking beautiful so far. Quick stitcher! This is going to be so pretty! I think you should take your time with it and savor every stitch! Beautiful start! I have started this one too, but quickly discovered that I needed to order more of the green threads. Isn't it such a fun stitch? I picked up my fabric for this today...I'm going to use 40 ct. raw linen with the Weeks threads. Yours is coming along beautifully! Wow! It looks wonderful! I want to do this one also. Have fun stitching it. This one looks beautiful already! May I ask you what is that small thing attached to your scissors, and what it is used for? Have a very nice stay in Florida, enjoy the sun and warmth we do not have here! Oh wow this is looking so pretty Nicole! This is really going to be cute! 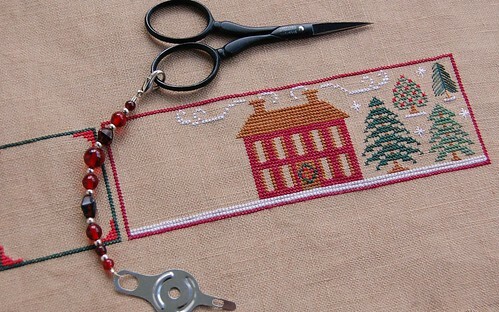 I think with your speedy needle you can finish it before Christmas!